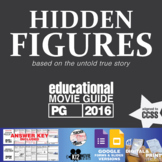 35 multiple choice questions to accompany the 2016 movie, Hidden Figures, directed by Theodore Melfi. 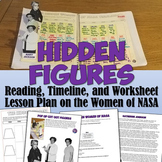 Great to use with any science, math or history class. Teacher info included. Questions are in order as they occur in the movie. Can be used with clickers or CPS systems. 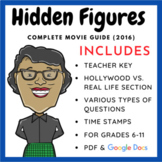 Student questions to accompany the film Hidden Figures. Some questions are factual and recalling questions, while others are analytical. Post-film questions included as well. 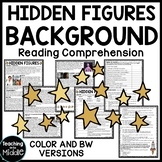 Can be used from grades 6-12 in a variety of subjects! Answer key included! 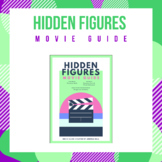 Hidden Figures Movie Guide & Reflection Questions PLUS Physics Calculations! 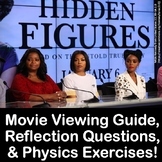 These are questions to go along with the movie Hidden Figures. This movie is great to play during Freedom week and it will also make your students sit back and think about how different America was back in the 1960's. 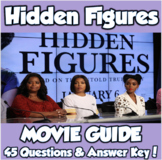 These are questions for students to answer as they watch the movie Hidden Figures. A key is provided as well. This includes a 3-2-1 worksheet, as well as topics for discussion with answer key.